This is the final post of my FIVE-part process for generating a significant amount of wealth via acquiring a business without spending any of your own money, growing and improving it quickly before selling it on and generating a big profit. In part-one, I introduced you to the concept of this five-part process and in part-two, I listed the 10 items you need to look for in identifying the perfect business to acquire. In part-three, I walked you through the 10-step acquisition process. So now, you are a business owner and in part-four, I introduced my 7P business success framework. If you missed part-four, read it here before continuing with this final part. We briefly covered exit in part-four. However, this post builds on the concept. 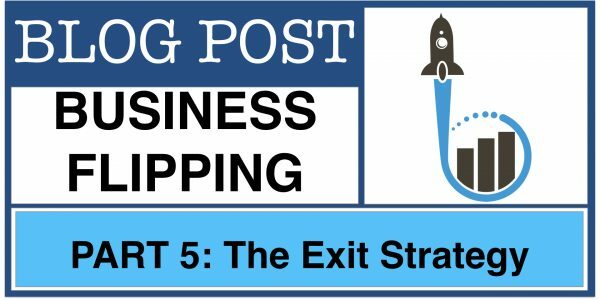 To review, I interviewed more than 2000 small business owners in 2014, and more than 85% of them went into their new business venture without having a clearly defined exit strategy. Without this, what are you working towards? Last time we discussed five types of exit. The trade sale to a hungry corporate is the easiest and most profitable. You need to identify potential acquirers as soon as you acquire your first business. Then, you spend your time ‘poking’ them in the market. Get in their way. Start eating their lunch. If you have acquired your business from a burned out owner-manager, you can bet the business was sleepy. With your energy and passion channeled into your new business, it will awake with a vengeance and pursue new market opportunities vigorously. Your competition will notice. As we discussed in the linked blog post acquiring a complimentary business does two amazing things. Cross-selling opportunities are abundant by selling products and services across the two sets of customers. Combining operations reduces overall costs so profit margins and naturally valuation (as a multiple of profit) increases. I have seen valuations increase by up to 10x by acquiring or merging businesses in this way. Large corporates have advisors constantly scouring the market looking for aggressive businesses just like the one you have just acquired. Just by implementing some new growth strategies and marketing more visibly, you will be noticed and subsequently approached. As you become more aggressive in the market, you will start to hurt your competition. As a smaller business to your large corporate competitors, you are more agile, faster-paced, and your customer service will typically be better. If you are a $10 million revenue business and secure a new $1 million customer, you will love and protect that relationship via world-class service, as it’s 10% of your total sales. Compare this to a $100 million competitor. That same $1 million customer will not be loved as there will be $10 million customers who get all that love and attention. You can snap at your competitors’ heels and eat their lunch, and then they will sit up and notice you. That’s what Acclarent did in the medical devices market. It deliberately attacked Johnson & Johnson in the market and caused it the pain. Johnson & Johnson acquired Acclarent for 63x profit. It was cheaper to make this acquisition than stand toe to toe with Acclarent in the market to win back the customers Acclarent had taken and would continue to take. As we have discussed, only 4% of start-ups succeed in business over the first 10-years. 96% fail. If your business is in the 4%, it’s extremely valuable to a large corporate who doesn’t have the time or patience to reinvent the wheel. Large corporates have tons of cash on the balance sheet and also shares to trade in an acquisition (shares that are tradable on the public market and can be turned into cash quickly). Acquisitions are a great use of that capital and management’s time to acquire to enter a new market. This is especially the case when the large corporate doesn’t have the sector knowledge or skills to succeed in the new market. That’s why Microsoft acquired Skype for 82x profit. Microsoft wanted to enter the VOIP (voice over IP) market and didn’t have the know-how to do it, or the time to build it from scratch. Even more importantly, Microsoft wanted to leverage Skype’s 663 million customers into it’s own business. Eventually, Skype will be part of Microsoft’s operating system, so the customers become sticky, loyal and consumers of everything else Microsoft sells. Exactly the same reason I acquired Mercury Interactive for Hewlett Packard back in 2005. HP wanted to enter key new markets that Mercury had locked down with its software. HP could use this lock as a funnel to cross-sell all of HP’s catalogue of products: servers, storage, services, PCs, etc. Facebook did a crazy 1000x profit deal recently, acquiring WhatsApp, also for these reasons of entering a new market and capturing new customers. To attract corporate buyers for these three reasons, you need to make your business irresistible and highly coveted. The more you do this, the higher your valuation multiple. A 5x multiple of profit is a conservative market valuation, up to 10x in technology and pharmaceutical sectors, but here are just a few examples of when 50x, 100x even 1000x deals happen. Another way to make your business more valuable is to systematize it. The biggest issue burned out small business owners have being unable to sell their businesses, is that they and their businesses are one and the same. They don’t really have a business; they just have a job. Everything important in the business has to flow through them. If they are on vacation, sick or not fully engaged, the business doesn’t work properly. To sell your business and especially for a premium valuation, it needs to work whether you are there or not. You need systems and operational processes that are clearly defined, and your employees are fully accountable for their individual contributions inside your business. If everything flows through the owner: processes, customer relationships, supplier relationships, etc. they will start to disappear as soon as the owner exits and corporate buyers know this so it will be reflected in a lower valuation. Finally, since profit margin and valuation go hand-in-hand, there are many ways to dramatically boost profits. Here are my favourite three. The first is about outsourcing. You can read it here. The second is controversial and involves firing (yep firing!) unprofitable customers. The blog post here shows you how to quickly and easily calculate which customers are burning your profits rather than driving them. And finally, how to quickly implement a 7-step process for increasing your sales AND profits by 158% or even 316% in rapid time. You can read it here. © 2013-2019 Ninja Acquisitions. All Rights Reserved. Website designed and developed by Webeteer Inc.